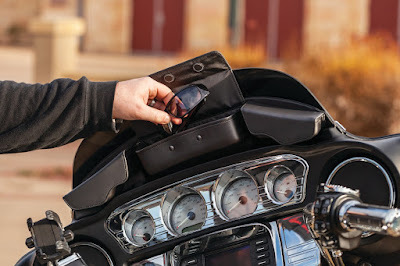 SOMERSET, WIS, APRIL 18 — Keep small essential items within easy reach with the new Batwing Fairing Pouch Bag from Kuryakyn®, now available for ’14-’17 Harley-Davidson® Electra Glide®, Street Glide® and Tri Glide®. The structurally formed Batwing Fairing Pouch Bag (P/N 5261) provides much-needed additional storage for wallets, cell phones, sunglasses or other items that require quick and easy access. Specifically designed with a compact profile, the three-pouch bag hugs the contours of the fairing and windscreen for maximum storage with a tailored custom fit. High-strength magnetic closures on each pouch ensure secure storage and convenience when opening or closing the flaps. 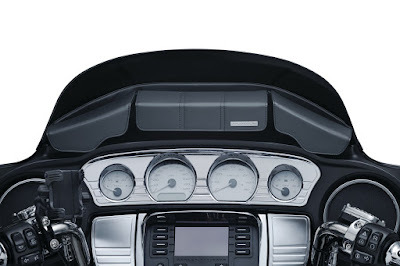 The main compartment also features an internal zippered storage pocket to separate and securely stow paperwork, smaller loose items, or coins. Full access to the fairing vent open/close switch permits uninterrupted airflow. Premium formed construction provides shape retention, durability, and eliminates the risk of sagging over time, while UV-treated outer vinyl guards against discoloration from prolonged sunlight exposure.